The popular and much-loved Berenstain Bears series are becoming quite hit within the Christian community following the release of the first four faith-based Berenstain Bears books. The new series of children’s books have together sold more than 100,000 copies since releasing on September 30, and have appeared on The Association for Christian Retail (CBA) Top 25 Kids Books list every week since their release date, with rankings increasing weekly. Currently, three of the books are among the Top 10 bestselling children’s book titles in the CBA’s December 2008 list. Most popular is Berenstain Bears God Loves You, which ranks at No. 3 on the CBA Best Sellers list. “Zonderkidz is thrilled to receive constant positive feedback from families and retailers about these new Berenstain Bears books,” says Alicia Mey, vice president of Marketing for Zonderkidz, the children’s division of Zondervan which published the new series. “We are proud to partner with Michael Berenstain on these new books that are inspiring young readers and teaching them in such a fun, familiar way that they are very special children of God,” she added in a statement. The original series, published by Berenstain’s parents, Stan and Jan, focused on everyday family experiences and produced over 300 titles since the 1960s. 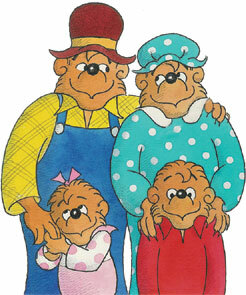 Story lines typically followed the Bear family as they dealt with topics relevant to both children and parents. “Over the years, my parents and I often heard from Christian families how much they appreciate the values-based themes of our books,” commented Berenstain, who joined his parents many years ago, writing several books and becoming the exclusive designer and illustrator of a series of large picture books. “By dealing with religion through the fun and laughter of the Berenstain Bears, we hope to nurture these families in their goal of raising children secure in their faith,” he added. The first four faith-based titles include The Berenstain Bears and the Golden Rule, The Berenstain Bears Go to Sunday School, The Berenstain Bears Say Their Prayers, and The Berenstain Bears – God Loves You! Two more titles are scheduled for release in spring 2009.